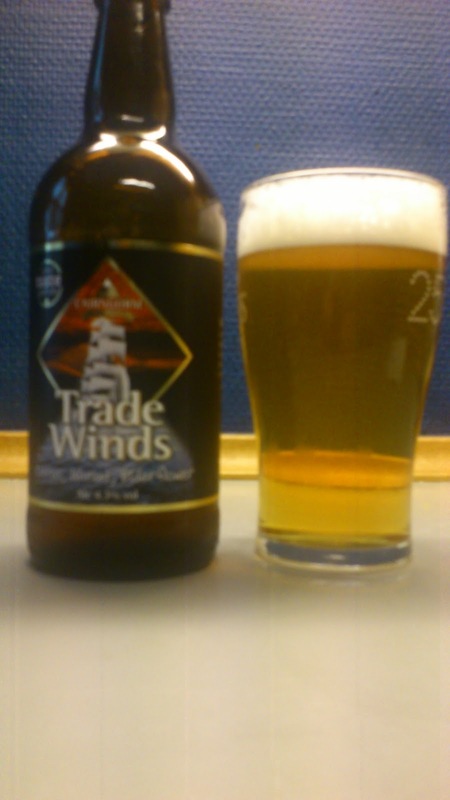 Trade Winds is a blond ale. A nice hoppy floral aroma wafts out when uncapped. Pours a clear gold with a creamy medium white head. A lot of citrus fruit, hops and a little malt in the background on the intake with a mild dry bitter finish. The aftertaste is dominated by elderflower and a small touch of honey. There is nothing that complex over this beer but it certainly put a smile on my face. What an idiot for passing on the draught ! Very fresh tasting summer beer and I'd have no second thoughts if the opportunity arose to get a few more bottles in. All the conditions were right when drinking this, maybe need to revisit when it's lashing down and miserable. This scored 7/10 on my 'saving the best to second last ?' beerometer. Where to buy CPH : Abigails british food shop in town has a selection of Cairngorms in that are not listed in the web shop though I can't remember if this was among them.